I changed it up a little. This is my "veggie" version. In a large skillet, saute the onion, yellow pepper in oil until tender. Add garlic; cook 1 minute longer. Transfer to a 5-quart slow cooker; stir in the remaining ingredients. Cover and cook on low for 4-5 hours or until heated through. Enjoy! 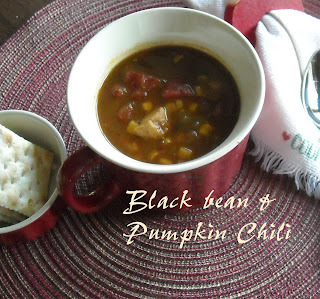 Excellent chili, very healthy and you don't taste the pumpkin in it at all. A new favorite at our house! Ok, I've got to try this, it looks delicious, love your blog, I'm following you in every way possible I think, and I have your button. This sounds delicious! Thanks for linking up again! Have a great Thanksgiving. I featured your recipe today @ Things That MAke You Say Mmmmm! Stop by & link up again. Looks good, need to try it. Visiting from Blog Bulge. I am a new follower.